The unique design of our award-winning Geo-Lastic Art gives even the youngest child the op..
Our Tabletop Easel is the perfect compact-sized art center for crafty kids! Beautifully de.. Available in Natural Wood Only Box Size 24x20x5 The Flip Top Dry Erase & Chalk Table..
Our Standing Easel is beautifully designed and made of the highest-quality wood and is the.. 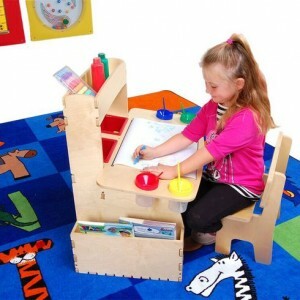 The Art Easel and Desk Combo is the ultimate art center for crafty kids! Made of beautiful..